We said goodbye to Mozart T. this afternoon. He died peacefully with his head in my lap, after enthusiastically consuming a bottle of ‘baby beef’ and a bottle of ‘baby chicken’. Rest in peace, dear Mozart, you have earned it. We brought Mozart T. into our home from the Baldwin Park Shelter in Los Angeles about a month ago. He melded smoothly into our pack and into our lives, without a ripple of disturbance. He was a very easy dog to be around. But he had his problems, physically. 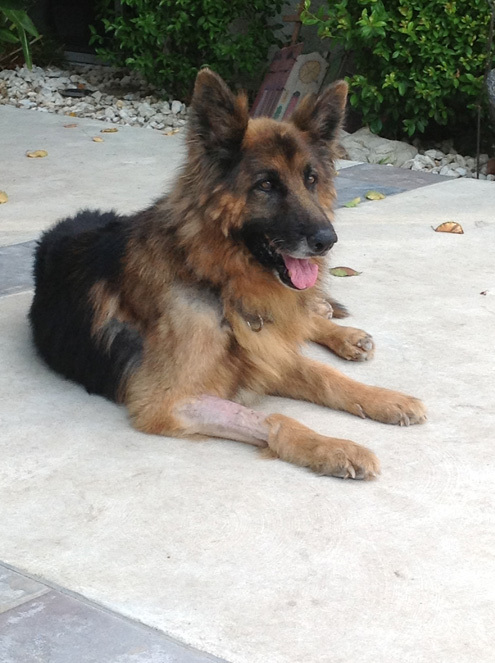 He was almost immobile when he arrived, with back legs that he could only use with help and great difficulty. We rearranged our house to ease his arrival, and helped him with his regular activities. As the weeks went on, we began to let our hopes rise as he began to use his rear legs more, and to move about more independently. That is not to say that we had hopes of curing his horrible disease, but we were encouraged to believe that we could extend his quality life a bit, and to make him more independent. And when he needed help, he developed a very efficient means of transmitting that message to us so that we could assist him. By last week, although his rear end would still collapse on occasion, and he never was able to walk smoothly, he was able to walk on all four feet about 60% of the time. Then yesterday, disaster struck. Within the span of less than an hour, he stopped using his rear legs entirely, and would drag them stretched out behind him whenever he moved from one spot to another. We gave him 24 hours to see if things would improve, but there was no sign of improvement. So we took him into the vet hospital. X-Rays gave no hint as to what might be causing his difficulty. But we did learn that he had essentially no feeling in his rear end from about his mid-spine back. None. With information from the veterinarian, I made the final ‘quality of life’ decision, and let him go. We still do not know the precise cause of this sudden, catastrophic failure, but we could readily see what condition he was in, and that was not tolerable. We learned a lot from Mozart about coping, stoic behavior, love, gentle interactions, and other life lessons. We think his last month was a happy one for him—we know it was for us in a bittersweet sort of way. Fare thee well, Mozart. We will meet again. 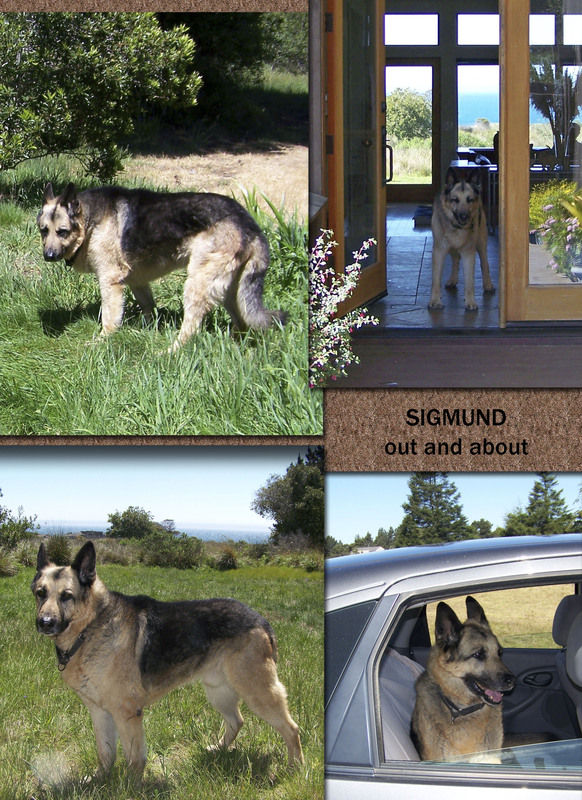 It is with great sadness that we pass along that Sigmund T. passed to the Rainbow Bridge last Wednesday. 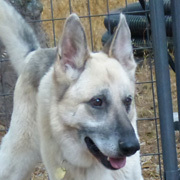 Siggy, as he was known to his devoted foster family, lived his last five months with Colby and Jim on the beautiful Sonoma Coast at Sea Ranch, just minutes from the beaches and forests. Siggy lived in warmth, comfort, and love until his final days—including breakfast and dinner in bed, and Colby and Jim acting as his loyal servants-tending to his every need and wish. When Sigmund T. first came into the Thulani Program, we were puzzled because he had been well cared for, neutered, and microchipped, yet his owners did not come to claim him. In fact, we titled his announcement post ‘Sigmund T.: Why Are You With Us?’. Unfortunately, it was a mystery that his foster family soon solved. 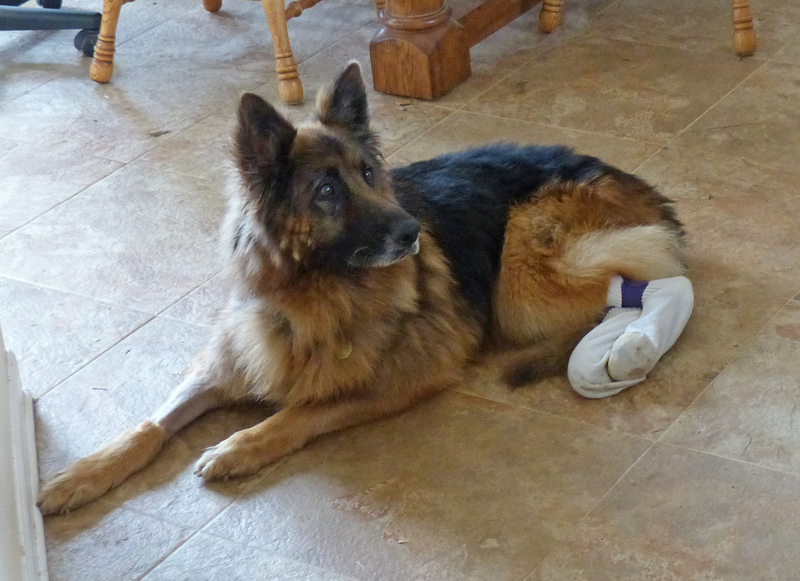 Siggy did have a level of Degenerative Myelopathy (or some similar condition affecting his rear end) but not really much worse than a lot of our senior dogs. But what his fosterers began to realize is that he was suffering from progressive dementia. Many people are only vaguely aware that dogs can fall victim to dementia just like people, and we often ignore the symptoms or attribute them to something else. Colby and Jim want to share what they have learned so that others may be better able to deal with their dogs if they suffer from this horrible disease. “He is a very sweet boy and does not deserve to suffer so this is for the best. 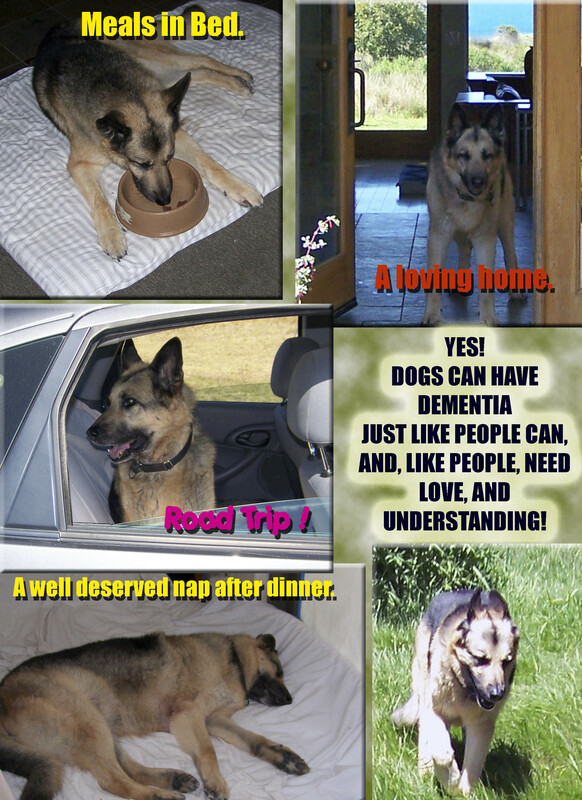 So many dog owners and cat owners are unaware that their old pets can have dementia so he has been a good chance to talk about it. I would give him hugs except he does not want to interact and does not want pettings, this is common with dementia – a pulling away from interaction with all. stressing over nothing – barking etc.. 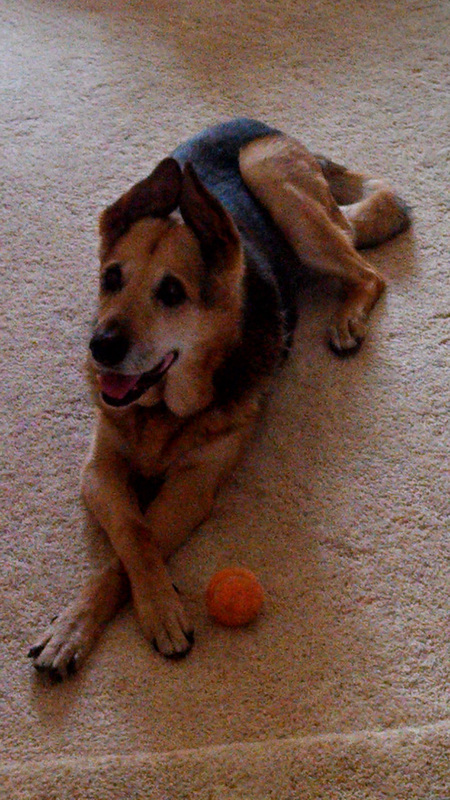 Fare thee well, Siggy—we will meet you at the Rainbow Bridge someday. 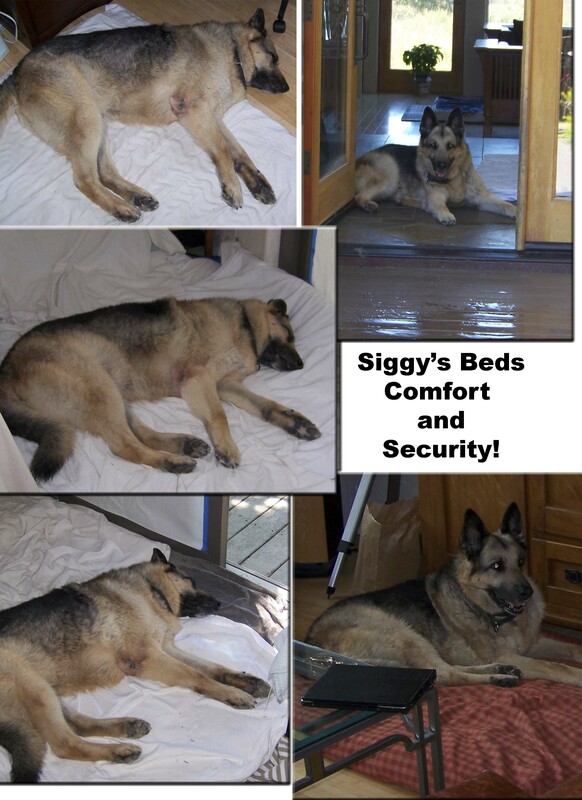 Below are some collages of Siggy’s life. Please enjoy them. And thank you Colby and Jim. A Letter From Dani T.
Like all dogs, I live in “the now.” Still, I think of the uncertainties in life as I grow older. I don’t wonder much about where my youth went. I don’t even wonder why I have stumbled when making a leap that used to be effortless. I just know it happens and I carry on as if it didn’t. I don’t look back, but my Thulani foster mom saw some value in turning the clock back for me. She wondered if I would ever be able to reclaim my health, let alone regain the beauty that once came naturally to me. These notions set my Thulani mom and me in motion. On the mend. I used to dread walking. I was weak and my nails dragged on the ground with every step. Nutritious and delicious meals were served until I put on a few pounds and I regained my strength. My walks became longer and longer and my stride turned into an elegant prance. There was one small set back though. It was the dreaded dental day. The docs pulled nine, yes I said nine, infected teeth out. Remind me to brush better. O.K….. so that wasn’t so much fun but I recovered and now it doesn’t hurt anymore when I eat. Getting to work. Like most Shepherds, I love to work. A “Help Wanted” ad at my mom’s office said they needed a “Director of Security.” I said “Great!” This could be right up my alley.” Through unabashed and blatant nepotism I landed the job. My duties: Display rugged strength; Remain watchful and alert at all times; and, defend my mom and her colleagues with courage and steadfastness. 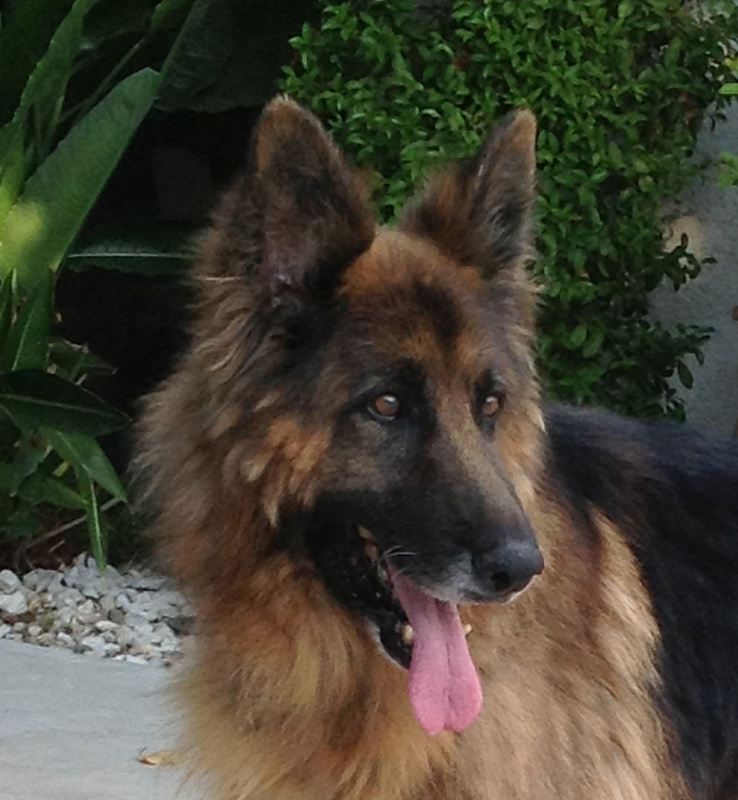 Hmm….all qualities admirable in Shepherds but I wondered if as a senior canine I would still be up to the task. I decided to go for it! It turns out I was more than capable of doing the job at hand. The visitors are all friendly and happy to give an old dog a scratch. The job offers frequent naps…..a must for any senior employee, and then, there is the most challenging part of my job; training the staff and visitors where the treats are hidden. Herding them toward the stash and giving the “Aren’t I darling?” look was the easy part. The softies give in right away. The treat goes from the hidden stash, to my trainee’s hand, and, “Voila!” …..right into my mouth. I wag my tail to show great praise for a job well done and everyone is happy. I love this job! What I am Today. My days of uncertainties have become few and far between due to the Thulani Program and the goodness of Thulani foster parents like my mom. I have a renewed enthusiasm for life. Like always, I live in “the now” and I know what I am today. I am grateful. I am worthy. I am proud. I am a beautiful and radiant Shepherd. Mozart T. came to the Thulani Program from the Baldwin Park Shelter in southern California, but not before he became a Rock Star Celebrity to facebook viewers all over the country. His story went semi-viral, with people all over pushing for someone to save him, and pledging funds to support him. As you can see from the attached pictures, he is a strikingly handsome old boy, but that only accounts for part of his star status. His personality is just as spectacular as his looks. And he is a fighter where adversity is concerned. Mozart has melded himself into his foster home with perfect ease—a good friend and social companion to four resident dogs, and a whole bunch of transient foster dogs. And his social skills with people are top flight. He is an absolute pleasure to have around. 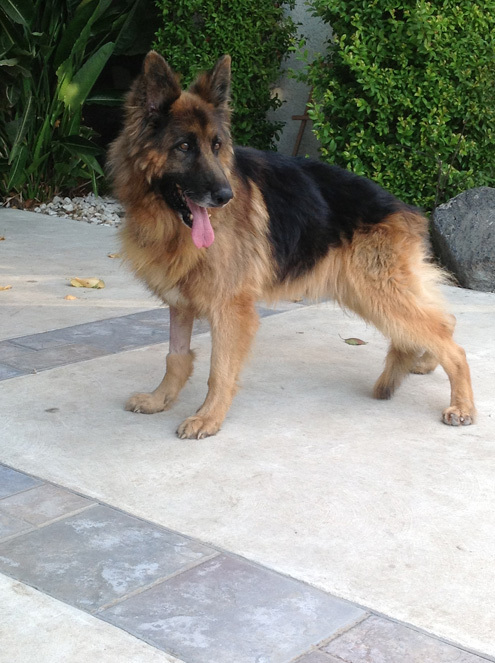 Mozart has fairly advanced Degenerative Myelopathy or some other neurological condition that has caused his rear end to be very weak and unstable. When he first came to us, we spent a lot of time helping him get from one place to another because his rear end often would just collapse. But his front legs are strong, his eyes sparkle, and he is alert and attentive to all the things going on around him (he doesn’t want to be left out of anything). He has a great appetite and his house manners are wonderful—he simply has this insidious disease. When Mozart first came here, his back legs would not support him, and he spent a lot of time dragging his feet and legs behind him. In the process, he rubbed his feet raw in many places. So we put socks on his back feet to protect them from being scraped. Well, the socks worked great to protect his feet, but most amazingly, he began to walk on all four feet much much more of the time. He now will roam and explore our very large back yard, go up and down a couple of steps, and move around the house at will. This is not to say that he doesn’t collapse at times, and the DM is not going away, but his new mobility is a joy to watch. And Mozart has revealed another wonderful trait—he talks. 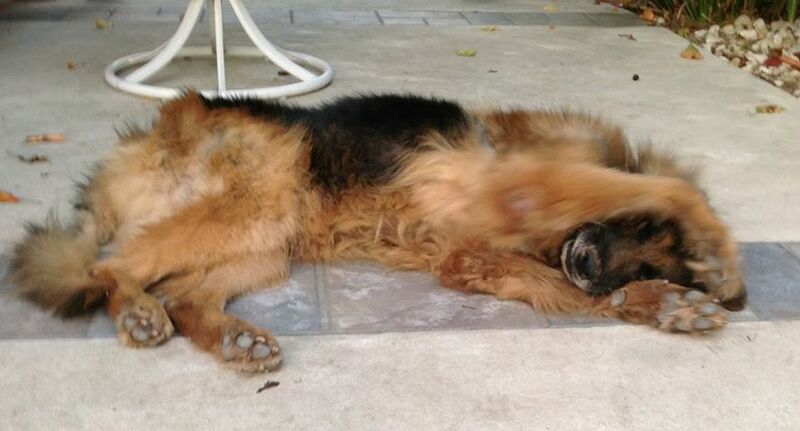 We all know that many German Shepherds talk, and some talk all the time. But Mozart is different. 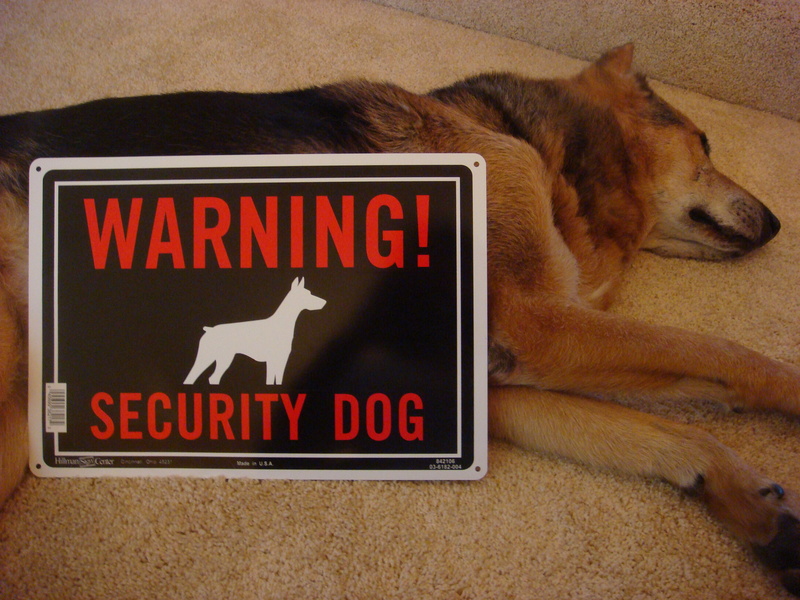 He doesn’t alarm bark, he doesn’t bark at the other dogs even when they are rough-housing, and he doesn’t go into the mindless barking that some dogs do. He has a characteristic bark that he uses for very specific purposes—when he wants something he asks for it. He asks for his meals—not the nagging barking or whining of some dogs—simply one or two barks. He uses the same bark when he wants help coming up the steps. He barks a couple of times and then waits for you to come help him. We realized what he was doing when one day he got himself wedged behind a chair and could not get out. He barked a couple of times and then waited for us to come and extricate him. No fanfare, no drama, no frantic barking—just a simple request for assistance. With that realization, we now know what to expect. Mozart is a joy to have around, and a great dog to observe. We will give him the best life we can for as long as he will let us. 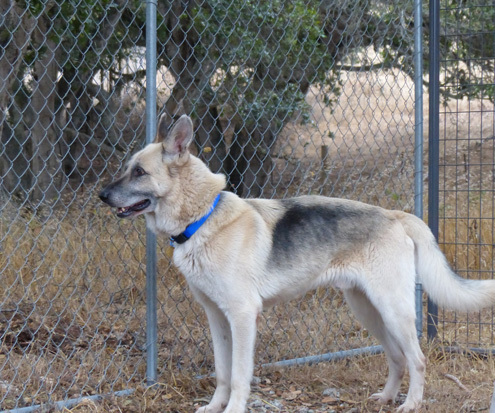 This handsome boy Ashton T. came into the Mendocino County Animal Services shelter in Ukiah as a skinny stray. But full of life!! 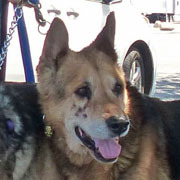 Unfortunately, during his medical evaluation, they found him to be heartworm-positive, and to have serious kidney disease. So the Thulani Program stepped in. 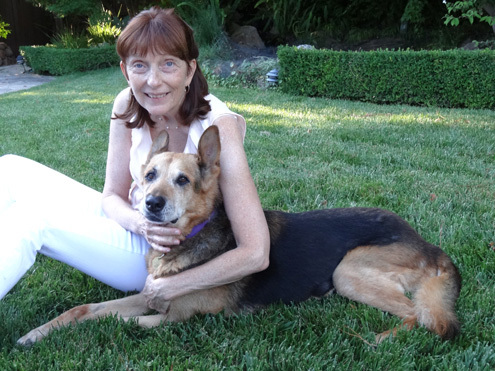 With the invaluable help of the shelter director and a volunteer, Ashton was transported to the San Francisco Bay area, and transferred to the Thulani Program of GSRNC. At the moment Ashton is being treated for the heartworm (luckily he does not have a very heavy load) and is on a special diet for his kidney problems. The shelter described him as a ‘picky’ eater, but he loves his new diet. Definitely a member of the clean plate club every meal. Ashton is part of the Thulani Hospice Program which means we will find him a permanent home and the Thulani Program will pay all of his expenses for the rest of his life. 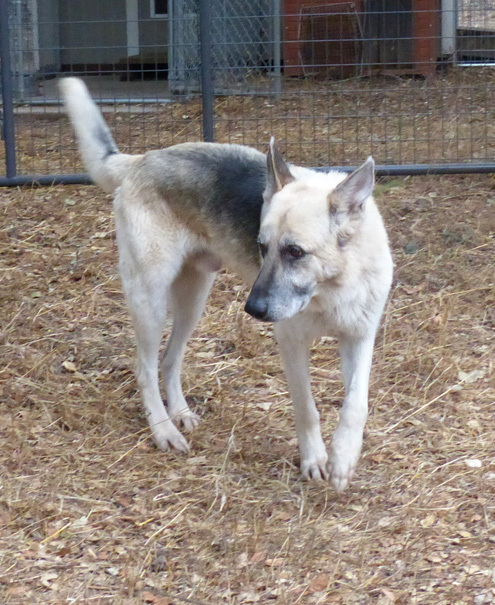 If you might be interested in helping Ashton live out a quality life or even providing him a loving home for whatever time he will give us, please contact Bob at thulanidog@gsrnc.org.